comment Spaces for the VIP Experience are very limited - Book NOW so you don't miss out! An exclusive behind-the-scenes experience led by a specially trained VIP guide who will immerse you in the past, present and future of Universal’s Backlot. Immerse yourself in a full day of moviemaking magic with your very own VIP private guide. Tour the movie industry’s busiest sets in a special trolley, where you can disembark to explore areas not open to the general public. Visit actual sound stages where blockbuster movies and TV shows are filmed and explore Universal’s award-winning sound department and enormous prop warehouse. On top of that, enjoy additional VIP benefits such as all-day admission to Universal Studios Hollywood, express access to all the rides and attractions, exclusive reserved seating at all shows, a gourmet lunch, valet parking upon arrival and so much more! 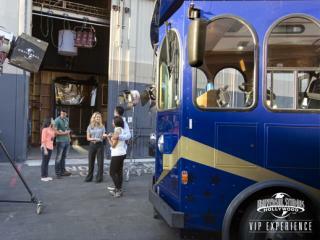 Expert VIP guides will immerse you in the past, present and future of Universal’s Backlot. Visit the enormous Archive and Collections Department to see how Universal’s historical props, documents, photos and costumes are preserved for history. Enjoy VIP privileges with escorted priority access to all rides and attractions including Harry Potter and the Forbidden Journey™. Begin your day in the exclusive VIP lounge with a light breakfast. Savor a gourmet lunch in a private VIP dining room, prepared by Universal’s very own executive chef. The Universal Studios Hollywood VIP Experience lasts approximately 6 hours - but guests can stay in the park after the tour for as long as they wish (within park opening hours). You will be sent a gate-ready Universal Studios Hollywood e-ticket not a voucher, ensuring minimum fuss when you arrive at Universal Studios Hollywood. There is nothing to redeem and you simply meet your guide at the VIP entrance. Please note - If you are not travelling within the next 72 hours then it can take up to 7 days for your e-tickets to be uploaded. The Universal VIP Experience timeslots can vary on a day-to-day basis. If the exact time requested is not available we will endevor to book you in as close as possible to your requested time. Children under the age of 5 years are not permitted on the Universal Studios Hollywood VIP Experience. Please note: Universal Studios Hollywood tickets are not valid at Universal Orlando Resort. Once booked and confirmed the Universal VIP Experience is non-refundable and non-changeable. 100% cancellation fees apply.